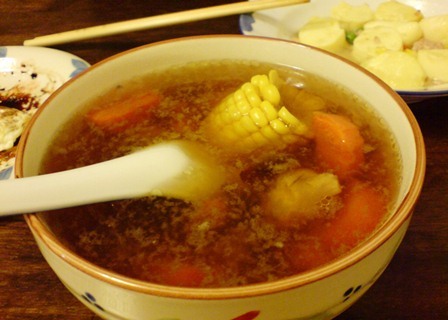 Chinese corn soup uses sweet corn in generally 2 ways. One with the corn still on the cob and the other uses just the corn kernels. A simmered soup will usually features the corn with the cob while quick-boiled soups tend to use loose corn kernels. You will see both used in the 4 corn soup recipes listed here. Sweet corn is high in sugar and therefore has a short shelf-life. It must be eaten fresh or should be quickly canned or frozen for storage. My appreciation of sweet corn came pretty late in life. Perhaps it has to do with how it was first presented to me. Over-steamed (is there such a word?) and served in a paper cup. Anyway, I know they can be added to soups to provide more nutrients and (more importantly) more crunch, so I have warmed up to them. Speaking of nutrition, according to scientists from Cornell university, when sweet corn is cooked, it releases a phenolic compound called ferulic acid. This is a well-known anti-oxidant which bind to cell walls and insoluble fibers. All the more reason to add corn to soups. 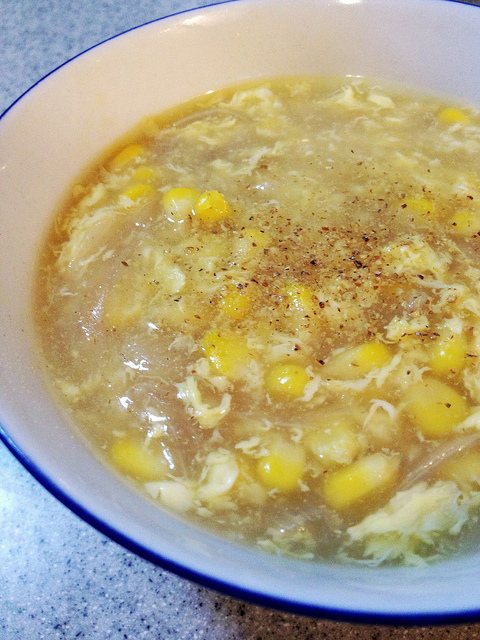 This is a quick and easy sweet corn soup. The corn kernels are freshly taken from the cob although I think canned or frozen corn is acceptable too. Turn this into a vegetarian soup recipe by replacing the chicken stock in the ingredient list with a vegetable one. 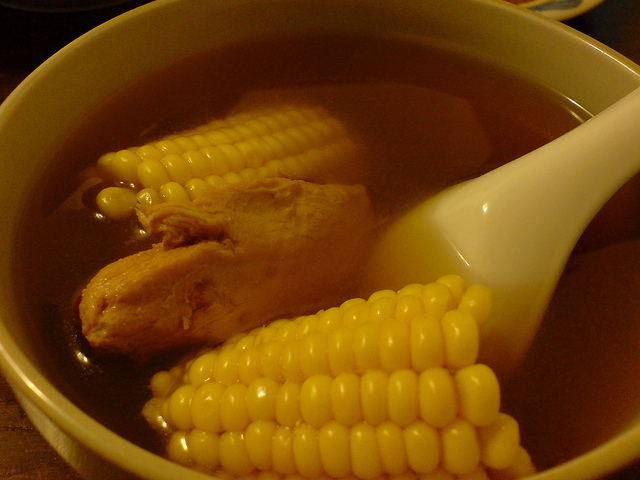 This Chinese chicken and corn soup recipe produces a sweet broth using fresh corn on the cob, carrot and fresh chicken. It is a sweet and refreshing soup. If you are experiencing a sweltering summer heat, cook this as it replenish bodily fluids lost through the heat and is also nourishing. Although I am all for ingredient substitution but I have to say that the corn on the cob is a must for this soup. Please do not use frozen sweet corn or canned corn. If you have some dried red dates in the larder, throw a couple in to further sweeten the soup. You can use the slow cooker or the thermal cooker to make this soup. This is a very simple Chinese corn soup recipe with only 2 key ingredients: sweet corn and pork ribs. If you are new to Chinese soups, this is a good recipe to start with. Although this is a broth it can be quite filling especially if you chomp on the corn. The instruction calls for a thermal cooking pot. The cooking time is about 4 hours. A normal soup pot on the stove or a crock pot can also be used if you are short of time. This is a refreshing soup using fresh coconut flesh, fresh chicken and corn on the cob. It is a nourishing broth suitable for a hot and heaty summer. Apart from the first recipe, the other 3 are mostly broths, which makes Chinese corn soups quite different from Western soups. I believe Western corn soups are usually creamy or chowder-like. The sweetness of corn in a broth enhances the appetite usually during the sweltering summer heat. I hope you will try the recipes listed here and let me know how it went.